^ Media embrace of Warren’s 1/1,024th heritage an epic failure. The Hill. Lizza, Ryan. The virtual candidate : Elizabeth Warren isn't running, but she's Hillary Clinton's biggest Democratic threat. Profiles. The New Yorker. May 4, 2015, 91 (11): 34–45 [July 1, 2015]. Lopez, Linette. 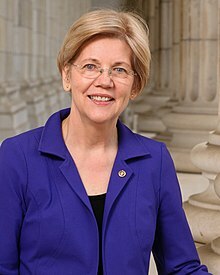 "Elizabeth Warren Introducing A Bill That Would Be Wall Street's Worst Nightmare." Business Insider. July 11, 2013.